(This story is an update to our original review of harnesses for handicapped dogs in 2014.) Our latest update was made February 2019. If you have a dog that is paralyzed or has hind end weakness, one of the specialized harnesses for handicapped dogs listed below will undoubtedly become your favorite tool to keep your pup mobile. The proper harness will make life easier for you and your dog when you move them from one part of the house to another, take them outside to relieve themselves and when you lift them in and out of the car. A harness gives your dog a sense of independence because it allows them to move about freely while it relieves the stress on your back as you assist them. When my dog Sophie became paralyzed in 2008 there were three companies that made dog harnesses for disabled pets, but today there are more than a dozen to choose from. What was an easy choice has become an overwhelming decision for pet parents. To help simplify the process, I’ve put the different types of harnesses into categories and I’ve listed my 5 favorite brands of harnesses for handicapped dogs. I hope it helps you determine which product is the best fit for your pet. Rear end harness or hind end sling – These products are meant for dogs with hind end paralysis or hind end weakness that prevents them from walking on their own. The harness fits around a dog’s back end and hips to support and assist them as you help them walk with their front paws. It allows you to lift them up high enough so their legs do not drag on the ground. Lifting harness – This harness typically fits around a dog’s mid-section and supports a dog that is still able to walk on his own, but needs help climbing stairs or assistance getting into a car. Dogs with severe arthritis or those recovering from back surgery are good candidates for this harness. 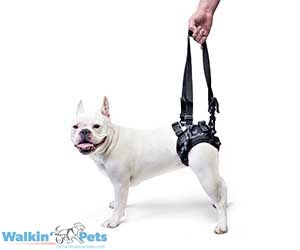 Full body harness – This product supports a dog’s hind end and their shoulders. It’s good for a dog recovering from surgery, a dog with end stage paralysis and dogs that need front and back support when you lift them. Amputee harness – This type of harness is especially made for tripawd dogs who have lost a limb. It gives added support to the torso where three-legged dogs need it the most. Back Brace – This isn’t actually a harness, but it’s a brace that gives support to dogs with Intervertebral Disc Disease (IVDD). Many new companies have entered into the disabled pet product marketplace. I’m going to discuss my personal favorite harnesses and slings. 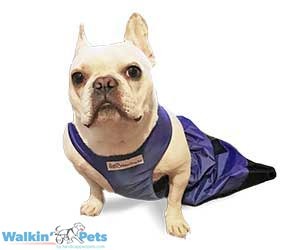 Walkin Pets by HandicappedPets has a large selection of harnesses, slings and full body support products. I like the Walkin Rear Lift Harness because it is made of soft but durable materials. It is reasonably priced and dogs can pee while they wear it. (That is truly a big deal). The harness is machine washable and the little pants on the Rear Harness are easy to put on and take off. I also appreciate the long nylon straps on the harness because it allows owners to lift and guide their dog as they walk without straining their back. My only suggestion to improve this harness would be to add padding to the straps because the nylon handles can be a little rough. Walkin’ Lift Combo Harness that provides complete lifting assistance and support for a dog’s front and rear legs. Walkin’ Support Sling for dogs that can walk, but need support to their mid-section. Walkabout FRONT Harness that supports a dog who needs help standing and walking. GingerLead makes a variety of heavy-duty, quality slings for dogs of all sizes. They are great for dogs that have issues with balance, suffer from arthritis, Degenerative Myelopathy (DM) and hip dysplasia. They’re also beneficial for dogs recovering from a back injury or orthopedic surgery. The company is named after a Golden retriever named Ginger who was diagnosed with severe hip dysplasia when she was 6 months-old. Ginger underwent a triple pelvic osteotomy (TPO) on her right hip and her family was given a sling to help her move about during recovery. The sling didn’t provide adequate support when the dog tried to play like a puppy and it didn’t give her owners a way to control her movement. They were afraid Ginger might injure the repair to her knee so they developed a harness that attached to her collar and leash. The product started a whole line of slings that has become the focus of the GingerLead Company. And if you’re wondering what happened to Ginger the Golden retriever; well she lived to be an old girl who passed away in 2015. WalkAbout Harnesses was the first rear-lifting harness used in the veterinary rehab industry and the first harness introduced for home use. It is the brand I used for my dog Sophie. The harness was developed by veterinary physical therapist, Cathy Erwin, who has worked in the field for more than 30 years. The Walkabout back end harness is made from durable, but soft materials that cushion a dog’s body and protect from pressure sores. The handles make it easy for owners to move their pet around. WalkAbout makes a variety of mobility products for disabled pets with each product being clinically tested before it is released to the public. The company also custom designs a harness for dogs and other pets with special needs. Help ‘Em Up is a sturdy full body dog-lifting harness for canines that need assistance with standing and walking, climbing stairs or being lifted into a vehicle. It’s a complete shoulder and hip harness system with handles that enable pet parents to lift a dog or provide assistance with mobility. It’s a great harness for aging dogs, dogs with arthritis, DM and those recovering from surgery. I personally know a fellow animal writer who used this harness extensively during her German shepherd’s battle with Degenerative Myelopathy. Help ‘Em Up is unique because it is designed to stay on a dog for extended periods of time. It also alleviates the need for additional equipment like a doggie ramp because the design makes it easy for pet parents to lift and transfer their handicapped dog. The harness also comes in a design with a moveable pelvic pad that gives additional support for dogs that have problems with their spine. AST has been creating individually designed harnesses for senior, injured, disabled and amputee dogs since 2006. Their most popular harness is the Pet Support Suit which is built to fit your dog’s specific body shape and measurements. The company also offers the Get-a-Grip harness for dogs who need assistance for a short period of time. They’re great for canines recovering from surgery. While AST works with individual dogs, they’re best known for their professional capabilities. The company supplies harnesses and slings to rehab centers throughout the US. One rehab center uses the Pet Support Suit as a winch to comfortably get dogs in and out of their hydrotherapy pool. You can read more about AST on their website. WiggleLess is a unique veterinary approved back brace for dogs with IVDD (Intervertebral Disc Disease). Thousands of dogs live with the pain of IVDD and the WiggleLess back brace can greatly lessen their discomfort. The one-piece brace is made of a breathable, lightweight material that is designed to stabilize the spinal column. It relieves stress on a dog’s back while providing firm back support. There are many other brands of harnesses and slings for handicapped dogs. If you’re thinking about one of these products be sure to consider if they are made of a durable material that anatomically works with your dog’s condition. The product should be comfortable for your dog and allow you to have control of your pet’s movements. Disclaimer: I am not a veterinarian. These products are my recommendations after reviewing many different harnesses for handicapped dogs. If you are considering the purchase of a harness, sling or brace be sure to discuss it with your dog’s vet before making buying one. I do have an affiliation with HandicappedPets.com. If your paralyzed dog is energetic, you might want to consider a drag bag for the time he isn’t in a harness. Thank you!! so helpful I am ordering one today! Putting Shaggy in his wheels is time consuming, I rather walk him on a leash/harness. thank you again. Great list! All of these products can be so helpful for disabled dogs and especially their owners. I have a 9 year old lab with hip dysplasia and I recently bought a rear support harness like the one you mentioned but the one I got was from Ortocanis. I found it here: http://www.ortocanis.com/en/technical-helps-for-dogs/23-rear-support-harness.html. Looks similar to the one you posted, just a little bit lighter. I love it!! Jennifer, I have heard of this harness before and I meant to find out more information, but it appears that I forgot. I promise to go to the Ortocanis site. Hi !! Could u let me know whats the diff bet the rear walkabout harness n the lifting harness? I m not sure which to get for our dog who has permanent back leg paralysis from a spinal injury. I also want to thank you so much for this blog… As i have no experience with a paraplegic dog i m learning a great deal from ur articles n feeling so thankful that there is a lot we can do for our Scout !! Thank you !!!! Thanks so much for ur reply !! So the lifting harness is more suitable for dogs who has still some function in their hind legs whereas the walkabout is more suited for dogs whose hind legs are completely paralysed? What u have for sophie is the walkabout right? Scout’s hindlegs are completely paralysed … We will get his wheels for him when his weight is stabilised (he is too thin now) but in the meantime i m hoping the walkabout harness can give him some mobility with our help. I can get the walkabout harness in Singapore where i m but the rear lifting harness i will need to order online. So i want to make sure i get the appropriate harness. Thanks again for ur help !!! Irene, Since your will harness will have to be shipped across the globe, I highly recommend writing directly to each company to be sure I haven’t missed some information. Hi Sharon !! I m in contact now with a local distributor for handicappedpets.com products. Thanks again for ur help n advice !! I hope you find the wheelchair and other products you need. Please send photos. Maribeth, I’m sorry to hear about your dog. My post explains the different types of harnesses, but briefly a rear lifting harness is best if your dog is NOT able to walk on his own at all. It should also allow him to pee while wearing it. I like the one from HandicappedPets.com. I also suggest you learn how to express your dog’s bladder. It will dramatically benefit his overall health. Feel free to ask any questions you have and if I don’t know the answer I am positive there is a pet parent who has one. If will also email you a guide I put together about the Essentials for Paralyzed Dogs which lists many of the products to make daily living easier. I have a 3 month old puppy with a recently diagnosed neurological problem. He has developed strong involuntary movements and his front legs do not work properly. His rear legs are less affected, but are not strong. He cannot now walk without falling. Our vet believes his condition is due to his poor start in life. He was found in very poor health and covered in ticks after being abandoned at four weeks old. Our vet is trying to help him with antibiotics and steroids. What harness do I need to allow him to enjoy more of life as a puppy? He weighs around 4 kg. Katy, I am sorry about your puppy. Because your dog is having problems with all four limbs, you probably want to consider a harness that supports your dog’s torso. You won’t go wrong with the GingerLead harness, the Combo harness at HandicappedPets.com or the Walkabelly from Walkabout harnesses. These are American companies, but I believe all of them ship worldwide. I have a 60lb Polish Lowland Sheepdog who has a problem with his rear legs (arthritis). I can pick him up, however, his pain causes him to snap at me..Your “help ’em up” Harness appears to solve that problem but I need more info before placing an order. Such as: what materials are used in the harness? Can he urinate while it is on him? Is it difficult to put on him? Do you have an outlet in Pensacola? What is the cost incl. shipping? Reach out to Help Em Up directly and I am sure they will be able to answer your questions. Is there a harness suitable for owners to support their dogs to toilet when they have no use in front or back legs? My 13 yr old beagle mix suffered from a fibrocartilagenous embolism aka FCE in the beginning of January. It has been a tough road, first 3 weeks we thought she would never be able to walk again, she had no use of one rear leg and the other was barely working. Flash forward – 20 PT sessions and a full 3 months later and she is able to walk with some or no assistance at all. She still struggles with getting up on her own and the slippery floors in the house are murder for her. SO we have non slip scatter rugs littering the entire house – but she is very happy and I believe will make enough of a recovery to live out the rest of her life happily. We are using the help em up harness, it has been a God send. I highly recommend it, I just purchased a 2nd one, because the first one is a tiny bit TOO big and I want to really wash it and let it air dry properly. Please do not give up hope, if your dog has suffered one of these events. Dana, Thank you for sharing your Beagle’s story. It is amazing how well dogs with a FCE stroke recover. I’m glad the Help Em Up Harness is helping. It’s a great harness for dogs with hind end weakness. Best wishes to you both for a full recovery. I have an ageing English bulldog who needs some support to do stairs. Is there a lift assist you would recommend for a 60 lb bulldog? Thanks for reaching out about your English bulldog. They are one of my favorite breeds! If your dog is able to use his hind legs, but needs a little support,the GingerLead harness is a great choice. If your dog is paralyzed, drags, knuckles or is unable use his back legs, I recommend the Airlift One harness from Walkabout Harnesses. You’ll find links to both companies in the story where you left this comment. My 5 Favorite Harnesses For Handicapped Dogs. https://lessonsfromaparalyzeddog.com/my-5-favorite-harnesses-for-handicapped-dogs/ Good luck. I have a 100lb Beagle/Basset cross who has patella luxation on both knees. He had surgery several years ago and did find until fairly recently. He is now having trouble climbing the stairs. I have been wrapping my arms around his waist and giving him a boost, but I have limited mobility and I worry that forgoing my cane to help him may cause me to fall. I think from the article that I need a general lift harness, rather than a back end harness, since all he needs is a boost. Am I looking in the right direction? Debbie, I’m sorry to hear about your dog. You are on the right tack with the harness. If your dog can walk, but needs a little support the GingerLead harness or Help Em Up harness are great choices. The rear lifting harness would be for dogs like mine who cannot use their hind legs. Good luck. I have a 9 y/o 175 pound Great Dane named Elektra that I love more than my own life. She had an Eric said and when she was young and has a plate and 10 screws in her back left back. Needless to say she also has arthritis in just aging issues with being a extra large breed senior dog. We had to use a towel and make shift sling after the accident when she was 1 Soshe may be nervous about the harness. She’s falling some while trying to potty & can hardly squat to poop. It causes her the most pain. Getting up is very painful too. But the cars trucks & suvs are the WORST! . SO….. what would be the best for my angel. Monika, Thank you for reaching out about your dog. Because Elektra is still walking and not paralyzed, I think your best option for a harness would be GingerLead or Help’Em Up. Both are made to assist a dog with hind end weakness. Hopefully one of these harnesses will work for you. Best wishes. Thank you so much for this blog! I devoured it when I made the decision to adopt my girl Kiara. I just have a question… Kiara is highly mobile. She drags herself from place to place. I want to take her places with me, she has wheels but she is horrified of the car. She cries, pees and has terrible anxiety. I can’t give her any meds for it as she is already immunosuppressed for an auto immune disorder. Any tips on getting a paralyzed pup comfy in the car? Or car seats so the don’t feel so imbalanced? It might also be helpful to put Kiara in a bed or crate that she is comfortable with while she is in the car. If she has a special bed at home, she will feel better curling up in it in the car. And you can start with short trips in the car so she can build up her confidence. And regarding a car seat, please look at the ones from Sleepypod. http://sleepypod.com/ All of the products from Sleepypod are crashed tested, but what I like best is the 3-in-1 use of the product. It is a cozy bed (your dog could use at home to feel secure), a carrier and it turns into a car seat. You didn’t mention Kiara’s size so beware that Sleepypods come in several sizes, but for small to medium dogs. And one final tip for traveling in a car is a car seat cover I love. It’s especially good for incontinent dogs. It’s called 4Knines and you can look at them on Amazon. https://amzn.to/2ymPOZM Please let me know if you have other questions. Best wishes to you and Kiara. Jennifer, It’s unfortunate you had a bad experience. Very grateful for this blog. My 15 1/2 year old Black Lab / Pit Mix (Cocoa) is suffering from arthritis (also has cushings disease). Recently she’s been having trouble with the stairs and supporting herself when she goes to the bathroom. The vet recommended a harness with more support, my local dog store recommended Solve It & also Help Em Up. Do you know anything about Solve It’s harneses? William, I’m sorry to hear about your dog. You’ve done a great job getting a big dog like Cocoa to the ripe-old age of 15 1/2. I am not personally familiar with SolveIt harnesses, but the one listed on Chewy looks very sturdy. I like how it provides support in both the front and hind end. The biggest difference I see between this harness and Help’Em Up is where they give support. Help’Em Up supports the belly while SolveIt covers the front and back end. If your dog has a strong core, Solve It looks like the winner. Otherwise, I would be concerned about your dog’s belly and spine being strained while using it. Help’Em Up is good for dogs who are still able to walk, but need some assistance. This is just my personal opinion, but hopefully it will give you points to consider before you make a purchase. John, Thank you for sharing your story about Help ‘Em Up Harness. Like Merlin, my dog Sophie didn’t like her wheels either so the harness was our lifeline to keeping her mobile. I’m sorry for your loss.